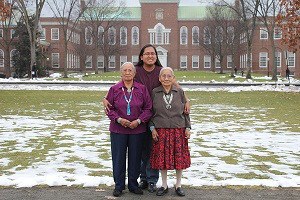 The education of Native American youth was part of the charter when Dartmouth College opened its stately doors two and a half centuries ago. But it wasn’t until recent years that the school began graduating indigenous students in significant numbers, and its Native American Studies program has emerged as one of the strongest in the United States. In Dartmouth’s first 200 years, through 1969, only about 20 Native American students graduated – an average of one every 10 years. But since 1970, about 220 Native students have graduated, with current enrollment at just over 200 and more than 500 students taking at least one course in the Native American Studies (NAS) program, says N. Bruce Duthu, Samson Occom Professor of Native American Studies and the Frank J. Guarini Associate Dean of the Faculty for International Studies & Interdisciplinary Programs at the college. The change at Dartmouth can be traced back to 1970, Duthu says, after the school’s bicentennial celebration and in the midst of a national push for affirmative action that encompassed higher education. It’s the same year that John G. Kemeny – a Hungarian-born math professor at Dartmouth who had served as Albert Einstein’s graduate assistant and earned his doctorate from Princeton at the age of 23 – was elevated to president. Kemeny was committed to restoring the college’s original mission, which meant broadening the student population beyond its overwhelmingly White, male, middle- and upper-class complexion. He quickly worked to ensure that a supportive network was in place before launching efforts to bring more Native students to the school. Things were ready by that autumn of 1970, when about 15 male Native students arrived on campus. Dartmouth became coed two years later, simultaneously launching a Native American studies program that now offers a major and a minor in the ­field. Duthu, who grew up in a ­fishing community in a Louisiana bayou and is a member of the United Houma Nation, arrived on campus as a freshman in 1976. By the time he graduated in 1980 with a bachelor’s degree in religion and a certificate in Native American Studies, there were three faculty with joint appointments teaching Native American studies. 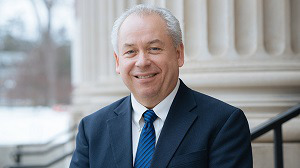 Today, the program has eight dedicated faculty, about half of whom have joint appointments in other departments and six of whom are Native American, as well as Dr. Bernard C. Perley, a visiting scholar funded through an endowment. Duthu, who has a law degree from Loyola and was tenured as a full professor in 2008, specializes in American law relating to tribal sovereignty and political relations with state and federal governments. The program offers 18 to 24 courses each academic year to educate students about the arc of Native experiences from past to present, according to Duthu. Dr. Colin Gordon Calloway, professor of Native American Studies and John Kimball, Jr. 1943 Professor of History, wrote a book that was published in 2010 titled ­The Indian History of an American Institution: Native Americans and Dartmouth. Dr. Melanie Benson Taylor, an associate professor and editor of Native South journal, was one of three editors of a volume of essays published in 2016 titled I Am Where I Come From: Native American College Students and Graduates Tell ­Their Life Stories. A full-time Native American curator manages the historic Native art collection – among the first at an institution of higher learning in America – at the college’s Hopkins Center for the Arts. In fall 2019, the program will offer its third biennial off-campus program at the Institute of American Indian Arts in Sante Fe, New Mexico. Sixteen undergraduate upperclassmen will take three classes at IAIA, the oldest and largest institution dedicated exclusively to the study of contemporary Native art, and immerse themselves in the region’s Native communities. In October, there was an on-campus screening and discussion of “Dawnland,” a documentary co-produced by Duthu about stolen children and cultural survival in the first government-sanctioned Truth and Reconciliation commission for Native Americans. The ­film previously was shown at universities, conferences and ­film festivals across the nation and is being aired on public TV stations this month. In March 2019, a group of Native alumni will gather on campus to discuss the direction the program should take in coming decades and how to prepare future generations of students with a vibrant and relevant curriculum. Funding is available to support a range of student experiences, from internships and independent work study to community-based archival research off campus. It was a strong Native community on campus that drew alumnus Jason Curley, who grew up on a Navajo reservation in Arizona. He enrolled at Dartmouth intending to study biology or another premedical field, but the more he learned through the NAS program and its faculty, the more he felt a desire to change fields. Curley graduated in 2013 with a major in NAS, a minor in digital arts and the desire to work in healthcare administration and policy development. After stints working in New York and Washington, D.C., he’s back in his home state working for a federal agency that helps Native students with scholarship and internship opportunities. But he hasn’t forgotten faculty and administrators such as Duthu, Calloway and Benson, whom he called “extraordinary individuals” who helped create a strong sense of community. Nor has he forgotten how a planned talk about a Native art form turned into a lesson on intergenerational learning that resulted in him and his paternal grandmother being included in an installation in Dartmouth’s Hood Museum of Art. The “Native American Art at Dartmouth” installation included a display of wool rugs handwoven by him and Helen Curley, who had taught him the craft as a child. She came to view the installation in November 2011 and died a month later. “She was overwhelmed with pride,” recalls Curley, whose mother, stepfather and maternal grandmother also had traveled to see the installation. There are other ways the NAS program is gaining recognition. For example, members of the graduating class of 2018 elected Calloway to receive the coveted Jerome Goldstein Award for Distinguished Teaching. Curley was proud to be one of those students. This article appeared in the November 15, 2018 edition of Diverse.